A key aspect of service systems is exploring and studying their economic and business components. Services are commonly part of an ecosystem that consists of other services (potentially competitors), service consumers, and further aspects such as underlying laws and regulations. 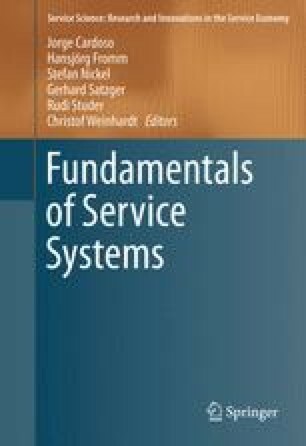 This chapter focuses on the design and analysis of service markets, which define how services are purchased and exchanged. In particular, market engineering is discussed as a structured approach to study service markets. This chapter should be regarded as an entry point into this domain, and assumes no prior knowledge. Therefore, a key focal point is on establishing the fundamental aspects of service markets from an economic point of view along with a methodology (agent-based computational economics) for their study and analysis. What assumptions do neo-classical markets impose, and how realistic are they? What are the main components of the microeconomic framework of Smith and the market engineering framework of Weinhardt et al., respectively? What are their differences? Explain the differences between the presented types of price differentiation and illustrate pros and cons by means of examples. Imagine you want to sell a web service and determine its price. What kind of pricing mechanism would you as a service provider prefer? What kind of pricing scheme would you prefer if you were a consumer? Describe in your own words the goals of agent-based computational economics? Provide examples of questions that can be studied using an ACE approach. Imagine you are starting a company that sells web-based services that support healthcare services. Please describe how you can apply the market engineering methodology to assess your company’s situation. The revenue model is an essential component for your company’s success and should include the pricing for your service. Please argue how you would choose a pricing strategy, and why the chosen strategy is right for your given situation. David Easley and Jon Kleinburg. Networks, Crowds and Markets: Reasoning about a Highly Connected World. Cambridge, 2010. Nicholas Jennings and Michael Wooldridge. Agent Technology: Foundations, Applications, and Markets. Springer, 1998. Leigh Tesfatsion and Kenneth Judd. Handbook of Computational Economics: Agent-based computational economics. North Holland, 2006. Steven Railsback and Volker Grimm. Agent-Based and Individual-Based Modeling: A Practical Introduction. Princeton University Press, 2011.